The Saint Joseph's Auxiliary presented a check in the amount of $7,100 to the Emory Saint Joseph's Hospital nursing staff from their annual Light of Love fundraiser. The proceeds from this year's event will be used to purchase new whiteboards in patient rooms, further improving communication between the nursing staff and patients. Emory Saint Joseph's nurses were selected as the recipient of this year's honor in recognition of their 5th Magnet® designation. Emory Saint Joseph's is one of only three hospitals in the world and the only community hospital to achieve this honor from the American Nurses Credentialing Center's (ANCC) Magnet Recognition Program®. Emory Saint Joseph's is a member of Emory Healthcare, the only health care system in the state to have two Magnet designated hospitals, which also includes Emory University Hospital. Auxiliary president Jane Symons, along with past president Marcie Schwefler , Light of Love chairman Angela Piper and other volunteers, presented the check to Chief Nursing Officer Joyce Soule and nursing staff. "We are so appreciative of Emory Saint Joseph's nurses and the care they provide for our patients every day. The nurses are the heart of the hospital," says Symons. A 32-year Auxiliary tradition, this fundraiser benefits a department or program within the hospital. During the Light of Love, members of the community had the opportunity to purchase lights in honor or memory of a loved one, and these in turn were placed on a Christmas tree in Emory Saint Joseph's main lobby. 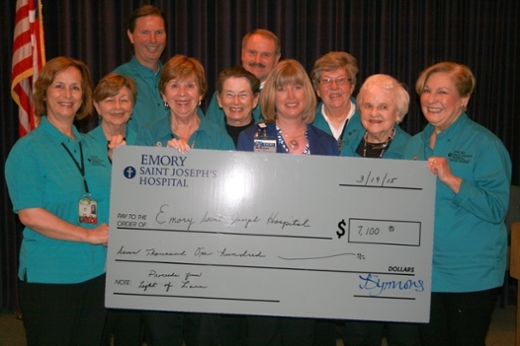 The Saint Joseph's Auxiliary is composed of more than 400 volunteers who donate their time and fundraising efforts for the benefit of patients, families and staff at Emory Saint Joseph's. During their 63-year history, Auxiliary volunteers have carried on the mission and traditions of the hospital with more than a million service hours.